What Is Hospital Observation Status? When a patient is put into the hospital, they’re assigned a status. Inpatient status and observation status are the two most common. 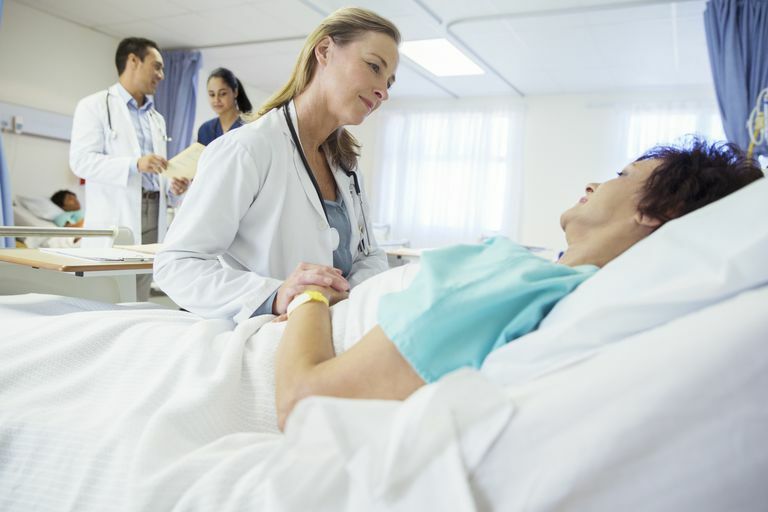 When you're admitted to the hospital, it's not always easy to figure out if you're admitted as an inpatient, or admitted under hospital observation status. Inpatient status is what we typically think of as someone being admitted to the hospital. Observation status is a type of outpatient status. However, someone in hospital observation status can spend several days and nights actually inside the hospital, even though he's technically an outpatient. In fact, he might be in the very same type of hospital bed, right next door to an inpatient. Observation used to be a way to keep someone in the hospital for a short time while doctors tried to decide if he or she was sick enough to need inpatient treatment. Now, observation patients can sometimes be kept in the hospital for days on observation status. It's easy to see how this can be confusing for patients since we don't tend to think of "outpatient" as involving an overnight stay in the hospital. Why Does Inpatient vs. Observation Matter? If you're sleeping in the same hospital ward and getting the medical treatment you need, why should you care whether you're on inpatient status or observation status? You should care because the difference could cost you hundreds or thousands of dollars. For people on Medicare, the distinction between inpatient and observation status is crucial in terms of coverage of care in a skilled nursing facility after the hospital stay. This is described in more detail below. And your health insurance company or Medicare won’t pay for your hospital stay as an observation patient in the same manner it would have paid as an inpatient. Instead, they’ll pay for your hospital stay using the outpatient services part of your health insurance benefit. Your share of costs for outpatient services like observation status may be larger than your share of costs for inpatient hospitalization. Although complex and confusing, there are rules, or at least guidelines, your doctor and hospital follow when deciding whether to assign you hospital observation status or inpatient status. To understand how the observation guidelines work and why hospitals are assigning patients to observation status, see why you’ll pay more. Mr. Smith comes to the emergency room with chest pain. Unable to tell for sure whether or not Mr. Smith is having a heart attack, the cardiologist, Dr. Jones, puts Mr. Smith into the hospital on observation status. Mr. Smith spends the night in a hospital room attached to a heart monitor. Throughout the night, nurses check on him regularly. He gets oxygen and has blood tests drawn every few hours. Dr. Jones may even have ordered more extensive tests to determine the condition of Mr. Smith's heart. Late the next evening, after two days and one night in the hospital, Dr. Jones has enough information to determine that Mr. Smith didn't have a heart attack. Mr. Smith is sent home. Since Mr. Smith's health insurance policy has a 25% coinsurance for outpatient services, Mr. Smith pays for 25% of the charge of every blood test and X-Ray. He also pays 25% of the charge for oxygen, of the charge for heart monitoring, and of the hospital's hourly charges for outpatient observation services. If Mr. Smith had received the same exact services as an inpatient rather than on observation status, depending on the type of coverage he has, he may have owed a single hospitalization copayment and his health insurance would have covered the rest of the charges. But it's also common for health insurance plans to count hospitalization towards the plan's deductible, and then begin assessing coinsurance charges. In that case, the total amount that Mr. Smith owed may have ended up roughly similar either way. Under Original Medicare, in 2019, Mr. Smith would have paid $1,364 for his hospital stay if he were considered an inpatient, whereas he would have paid $185 plus 20 percent of all the costs if his stay was considered observational instead of inpatient. So his costs under observation would depend on how much care was provided to him, and how many tests were run (many Medicare enrollees also have supplemental coverage, in the form of Medigap coverage or retiree health benefits from a previous employer, which pick up some or all of the out-of-pocket costs under Medicare). Patients are sometimes well enough to leave the hospital, but not yet well enough to return home. Skilled nursing facilities can be used to fill this gap. A patient who has a knee replacement, for example, might only need a few days in the hospital, but may still need a stepped-down level of care at a skilled nursing facility before being able to return home. Original Medicare only pays for care in a skilled nursing facility if it's proceeded by at least a three-day inpatient hospital stay (Medicare Advantage plans can waive this requirement) If you're in the hospital but under observation status rather than inpatient status, it doesn't count towards your three days. In that case, once you're released, you won't be able to get Medicare coverage for a stay in a skilled nursing facility. This is one of the reasons it's important for patients and their families to understand whether inpatient or observational status is being used. Medicare.gov. Are You a Hospital Inpatient or Outpatient? If You Have Medicare—Ask! Medicare.gov. Medicare 2019 Costs at a Glance. Managed Care. Medicare Advantage Takes On 3-Day Rule. Medicare.gov. Skilled Nursing Facility (SNF) Situations. How Do You Qualify for Medicare Part A Hospital Insurance? Health Insurance: How Does a DRG Determine How Much a Hospital Gets Paid? What Is a PPO and How Does It Work?